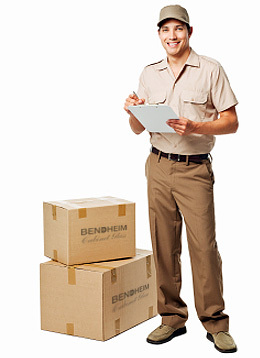 Bendheim takes great care when packaging your order for shipment. Please review the following information regarding the shipping of our products. Sample orders ship within 1-2 business days via US Postal Service first-class mail, from our New Jersey facility. All other orders are shipped via Fed Ex or UPS. Approximate lead time for annealed (non-safety) glass is 10 business days. Tempered and laminated safety glass 20 business days from date of order. The final price will include the cost of shipping, boxing and handling your order. The number of packages you receive will be based upon the maximum of 50 lbs. net weight per box. We will email your shipment tracking number the moment your order leaves our plant. All shipments are insured. Please note we are not liable for loss or damage of merchandise once it has left our premises. In case of damage, notify us within 2 days of receipt and hold the package for Fed Ex or UPS inspection. Failure to notify us in a timely manner may void your claim with the carrier. After successful completion of these steps, we will replace your glass at no charge as quickly as possible. All orders are custom cut to your specifications and cannot be returned. Please note, these decorative rolled and handmade glasses may exhibit occasional small bubbles and surface imperfections which are characteristic of the glass and not considered defects. Slight variations in color and pattern are also acceptable. Browser settings vary and colors shown on our website may vary somewhat from the actual color of the glass. This is not a cause for rejection. In the event defective or incorrect merchandise is received through an error on our part; please notify us within 5 days of receipt for return authorization. The packaged product has been tested in compliance with International Safe Transit Association (ISTA) Project 1-A Vertical Impact and Vibration Test Procedures. We invite you to click here to browse our online glass inserts gallery and begin your selection process. You can also contact us through our online form. We are at your service.